The most popular 50's solid colors are black and hot pink. We have assembled both of these colors here for you to mix and match and build your own perfect 50's tableware set.The solid black, pink and light blue are the staple of your 50's decorations. Use a Large Black Plate underneath a Fabulous 50's lunch plate. Or accent one of our other 50's tableware sets with a solid cup, like our Magenta Cup, or napkin. You can also spice up your actual table with a fun table skirt, like our Black Plastic Table Skirting. Another option you have for your 50's table decorations, is to use a solid tablecover, like our Turquoise Plastic Table Roll. For your 50's party, take the classic route and get solid colors. Grab the poodle skirt and records for this party. Make a balloon tower of light pink, hot pink, black ,white and blue to make a really cool statement piece. This tableware would also be great to match with out other 50's Rock N Roll tableware. To add a creative aspect to the party, get old records and melt the sides up to make a bowl. Check out our Pintrest page for a 50's Party ideas. You could also make records out of construction paper and hang them from the ceiling with streamers. Sine the 50's was a time of simplicity, don't get too crazy with your decorations. Our 50's Solid Tableware to mellow out your other awesome 50's party supplies. 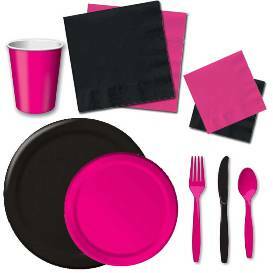 Use our Black Lunch plates and Magenta Dessert Plates at each seat for a little fun yet simplistic look. Use the third 50's color for your Turquoise Plastic Table Roll. Check out the rest of our 50's party supplies for fun decorations that will look great with your solid color tableware!